Ever since I started eating healthy, I've loved Amy's soups. They are delicious and much better for you than the usual Campbel's or even store brand soups. 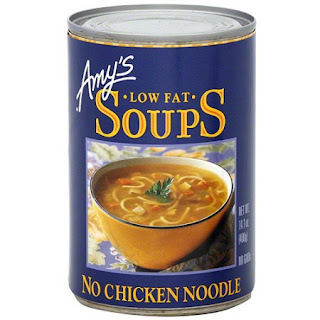 Most of Amy's soups are also Organic and (I believe) all of them are free of refined sugar. I think those are the reasons why I started buying them in the first place. As I mentioned before, I've been eating these soups for 3 years now, and always enjoying it. They are the only canned soups I buy and I just love all of them. Or loved, until I tried this one. Having only eaten organic for 3 years, my palate is very refined and anything that is processed or non organic tastes really terrible or tasteless to me (just the other day I ate some non-organic strawberries and it felt like I was eating water). And this soup was no exception. The only non-organic ingredient (Hydrolyzed Corn And Soy Protein) made the "chicken" taste kind of chemical or artificial. That completely turned me off from this soup. I ate it but did not enjoy it. The soup has some little squares that do look like chicken meat. I noticed that the bad taste came from those pieces. I think the problem is that they tried to make those squares taste like chicken by adding some (obviously) artificial flavour. And that just made it taste horrible. I believe they would have been much better off not trying to make the soup taste like chicken, and just creating a new flavour. I will continue buying Amy's soups, but not this specific flavour. Or at least not until they change the ingredients. If you are used to only eating organic like me, don't buy this.